While most work has focused on coccoid green algae and/or cyanobacteria, a largely overlooked lineage of lichen photobionts is the Trentepoliales, a group of filamentous, carotenoid producing green algae. Trentepohlian algae are associated with one fifth of lichen species world wide and are particularly common as a photobiont of eipiphytic lichens in the tropics. Trenepohlian algae are also very commonly found as free-living colonies on tree bark, leaves and rocks. Like most of the groups discussed here, the taxonomy of the Trentepholiales has not held up to scrutiny with molecular phylogenetic methods and the various genus names do not appear to be meaningful. The only published study that I am aware of on the diversity of Trenetpohlian photobionts is Nelsen et al. 2011 (J. Phycol. 47, 282–290). They found that lichenized strain are mixed with free-living ones throughout the phylogeny and that lichen fungi from different classes can associate with very similar photobionts. Since the publication of this study, a large number of additional sequences from Trentepohlian photobionts have been deposited in the databases. These includes sequences of both ITS, which is the marker that has been used the most widely in studies of Trebouxiophycean photobionts and rbcL, a chloroplast gene that is probably the most extensively used phyologenetic marker in plants. Since rbcL was used in the study mentioned above, that is what I used for the analysis presented here. Methods are the same as those described previously. Because the rbcL is so highly conserved, long sequences from more distantly related algae had higher Evalues than shorter sequences from Trenetepohlian algae. This means that I had to manually add missed sequences with accession numbers that were bracketed by the ones that were found. It also meant that I had to exclude sequences from other algae that formed a large clade sister to the Trentepohliales in preliminary analyses. The detailed steps of this analysis are here. Datasets can be found here. This phylogeny includes the four major clades discussed by Nelsen, but there are also a large number of lichenized strains that branch near the base of clades 2 and 3. 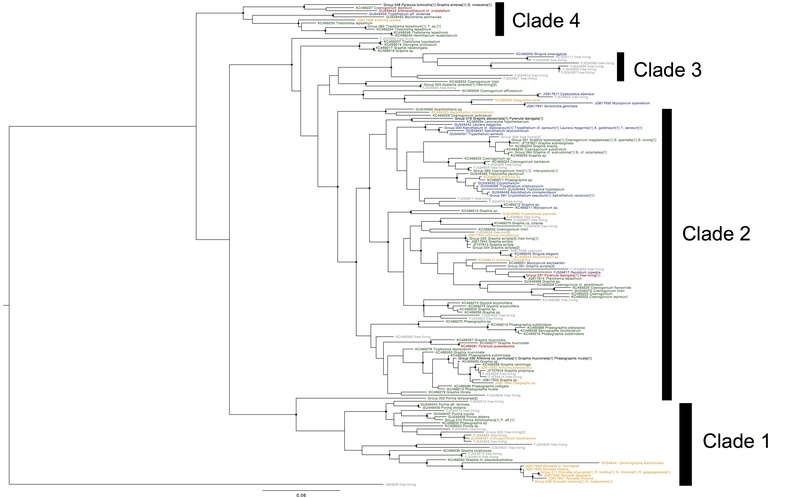 The new sequences also greatly expand clade 4 (from 3 to 14 photobionts) and add a lichenized strain to clade 3 (a Strigula photobiont, as predicted by Nelsen et al.). Non-lichenized strains are distributed throughout the tree, and there are two case where a free-living and a lichen photobiont have identical rbcL sequences. There are a few subclades that appear to be specific to a single lichen genus (Roccella photobionts in clade 1, Coenogonium photrobionts in clade 2), but the most remarkable thing about this tree is the phylogenetic breadth of lichens that share the same photobionts. Clades 2 and 4 both include photobionts of four different classes of Ascomycetes: Lecanoromycetes, Arthoniomycetes, Eurotiomycetes and Dothideomycetes. Indeed, there are two cases of photobionts of Pyrenula (Eurotiomycetes) and Graphis (Lecanoromycetes) having identical rbcL sequences. This is clearly a group that is worthy of a lot more study. There appear to be a broad range of specificities, from species that can switch among two or more classes of fungi (in addition to living independently), to ones that are specialised on a single host genus. Additional sampling of the Eurotiomycetious lichens in particular would be helpful to determine the phylogentic breadth of hosts for many of these lineages. Extensive sampling within species would also be helpful to range of suitable photobionts for individual species. This entry was posted in Green Algal Photobionts and tagged Dothideomycetes, Eurotiomycetes, Lichen, Pyrenula, Trentepohliales. Bookmark the permalink.